Our Photo Booth is an entertaining way to take lasting memories. Our booth is a modern, fully automated kiosks that add excitement to your special day! Our booth has a touch screen, can print in black and white or color, produces high quality pictures, comes with fun, colorful props, unlimited photos during your event, a party attendant and we can create a customized logo or message on your pictures! Our photo booth is $650 for three hours, and $70 for every extra hour. Automated full color touch screen so that you can see yourself as you pose. Prints pictures and duplicates in 15 seconds. Customized template with your Logo and Message Photo strips or Postcard style photos with multiple shots Choose between colour or black and white photos Large assortment of fun props; hats, glasses, costumes, etc. 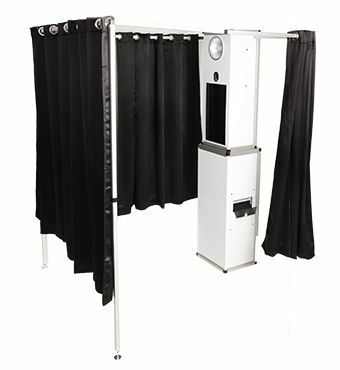 Photo booth Attendant Surrounding privacy curtain (black) Fits up to 10 adults Unlimited trips and photos for your event Digital Download When you are hiring a photo booth rental company make sure to do your research and go with a reputable established company that will be there for you on your big day. Value for your money and reliability should be your main concerns, not price alone.